The Australian job market has continued its roller coaster ride of the last couple of years in February with the unemployment rate dropping to 5.8 per cent. Before we get too excited that we have got through the holiday season and that February’s numbers reflect the same growth we saw in October and November 2015, however, we have to take a step back and delve a little deeper. For those looking for a silver lining, whilst we saw a decline of 15,600 in part-time jobs, this was offset by a growth of 15,900 full-time jobs. The numbers also show a clear divide between the east and west coasts, and this is reflected by the strength of the construction and infrastructure investment in those states over the last few years, which is now yielding the jobs we were promised. In Victoria, the unemployment rate fell from 6.3 per cent to six per cent and in NSW it dropped from 5.5 per cent to 5.3 per cent, but the best performer by far was Queensland where unemployment fell from 6.4 per cent to 5.6 per cent. This put it just behind the jobs star of the Australian economy over the last year, NSW. Turn further south and west, however, and the outlook is not so great. The gains in Queensland, New South Wales and Victoria have been offset by losses in and a rise in the unemployment rates in Western Australia and Tasmania and a massive increase in South Australia, where the unemployment rate rose from 6.8 per cent to 7.7 per cent. Ask any economist right now and they will tell you the Australian Bureau of Statistics numbers can’t be trusted, and the volatility in the numbers from month to month indicate as much. Therefore, to get a clear picture, you have to look beyond this data at other market indicators such as the Seek and ANZ JOB ads. Although these showed a slight decline in February, they have been trending positively for a number of months. This decline is a reflection of some decline in confidence in the broader job market. 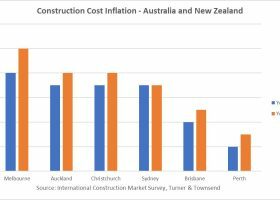 However, underlying demand across the construction sector still remains high, reflecting the positive contribution this sector is currently making to the jobs and the Australian economy.